As a Spanish-speaking, cardiac interventionalist, Maria Alexandra Rodriguez, MD, readily admits that she is a bit of an anomaly in her field. 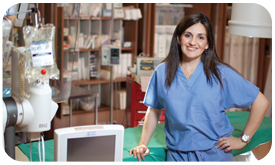 "There aren't a lot of women who choose to specialize in interventional cardiology, and there are even fewer female interventionalists who speak Spanish," says Dr. Rodriguez, who joined Montefiore Medical Center as an interventional cardiologist in August 2011 after completing a fellowship at Jefferson University Hospital in Philadelphia, and is also Assistant Professor, Medicine, at Einstein. "Dr. Rodriguez is an asset to our cardiology team as we work to expand our capabilities in interventional cardiology and our outreach efforts to the Bronx community," says Mario J. Garcia, MD, Chief, Cardiology, and Co-Director, Montefiore Einstein Center for Heart and Vascular Care. "Women's heart health and preventive care are increasingly important, and Dr. Rodriguez's expertise will allow us to grow in these areas." Dr. Rodriguez says, "I'm someone who enjoys building a strong doctor/patient relationship-something that goes a long way when it comes to ensuring adherence with treatment and follow-up care. Being a woman who speaks Spanish helps me connect with my female and Spanish-speaking patients. Once you build a relationship with a patient it's easier to teach him or her how to live a healthier life and stay out of the cath lab in the first place. I think one of the greatest things about my job is seeing a patient become healthier and knowing I helped make a difference in that person's life." Dr. Rodriguez earned her medical degree from Creighton University School of Medicine in Nebraska and did her residency at Yale-New Haven Hospital. She later completed a cardiovascular disease fellowship and an interventional cardiology fellowship at Jefferson. Her areas of interest include women's heart care, preventive women's healthcare and hypertensive crisis. "In medical school I did my rotation in cardiology and cardiothoracic surgery and loved it," she says. "The field is challenging and filled with innovation-there is always something new in the pipeline. I think we're going to see these innovations continue, not just in the area of coronary vessels but also with percutaneous techniques to repair damaged heart valves and atrial septal defects." Since coming to Montefiore Dr. Rodriguez has gotten involved in the hospital's outreach efforts through clinics in the Bronx that treat the underserved. She also sees herself as a future mentor for women who are considering the field of interventional cardiology.